San Gimignano is a classic medieval walled hill town in Tuscany with a history dating back to 63 BC. During the middle ages, the town was an important center for trade and for pilgrims traveling to or from Rome. “Tower Envy” was the name of the game back in the 11th Century when the original San Gimignano had 72 towers, built by patrician families probably to demonstrate their wealth and power. Today the historic center is a UNESCO world heritage site for its architecture. Its 14 surviving medieval towers create a beautiful skyline visible from the surrounding countryside. 7 of these remaining towers are around Piazza del Duomo and the tallest tower is Torre Grossa, 54 meters (177 feet) in height, dating from 1298. 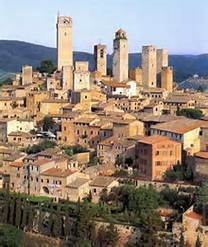 San Gimignano currently has a population of just under 8,000 and attracts millions of tourists from all over the world. The city is obviously packed with tourists most of the year and can be a bit crazy during the height of the summer season. Just trying to find a parking place can be challenge! But there is a much better way to immerse yourself in this wonderful destination and that is to adopt an independent tourist’s mind set. Slow down and spend more time in each interesting location. Instead of 14 cities in 16 days try 4 cities in 16 days. You just spent a great deal of time and money to get here so what is the hurry? Some people like to say they “saw” a lot of cities on their vacation but in reality they rushed through a maze of sites as someone droned on and on about facts that you cannot even remember! One of the saddest sites to see are the tour buses full of people traveling along on the highways through beautiful scenery and everyone is fast asleep. If you wanted to take a nap stay home! Let us introduce you to the independent tourist’s approach and immerse yourself into the culture as well as the country. For starters the internet makes the planning phase easy and fun too. Plan the trip months in advance, get a good map, a decent GPS (Garmin is excellent), rent a car (no less than a medium/standard sized), learn a few phrases and finish it off with a great sense of adventure and a touch of a positive attitude. With regards to visiting San Gimignano book a local hotel or even an apartment rental inside the walls. We used The Parker Company (theparkercompany.com) for our apartment selection and they proved to be an excellent resource. Having close proximity to this village is a must since you have so much more flexibility than the typical day trippers that invade the place. Getting up a little early affords you the chance to score amazing breakfast pastries or breads at the local bakery and returning to your “home” for a leisure breakfast. If you prefer to “eat out” in the morning before the “troop ships/tour buses” arrive, savor a traditional Italian breakfast of caffeine and sugar at one of the many a coffee bars located throughout the village. Remember the no-no…no Cappuccino after noon so enjoy them in the morning only. Wander around town for some souvenir shopping and possible snacks but keep an eye out for the first wave of “invaders”. First sign and it is time to venture out into the beautiful Tuscan hills. Armed with a list of preselected destinations (be realistic in the count with three as an average), a map and a GPS hit the road for a drive thru breathtaking vistas. EXPLORE! During the day explore the Tuscan hillside, the open air markets, the small towns nearby, find a unique place for lunch, the vineyards, the olive oil stores, and the cheese merchants (one exceptional dairy farm is locate directly on the road going to the village) and plan on returning in the late afternoon. The crowds board the ever present tour buses and recede from this medieval masterpiece like clockwork (5:00 PM and gone). Once the hordes vacate the city it reverts back to a tranquil environment and transforms you into the days of yesteryear…..simple Italian living amongst the “locals” that are fortunate to have lived here for generations. In the early evening walk around the town (hands clasped behind your back is optional but common) and greet everyone with a simple nod, smile and “buonasera” (try it…..it is catching). After a day you will know the places to shop, and the popular restaurants to dine at……ask a local too. Now the real fun begins as you are way more than a “typical tourist” that hits and runs……..you are living vicariously yes, but still more intently than the skipping stones that just invaded “your” town. The local merchants actually recognize you after a while and are very open to gaining a possible repeat customer (good business sense too). Dusk and the cooking is going into high gear as everyone is preparing for the evening meal. As a side note….Italians usually purchase the ingredients for the meal that very day so everything has to be fresh……try it…..cook something in your rental unit. The abundance of excellent ingredients makes everyone a better cook! As we walked across the cobble-stoned streets we were enjoying the many fragrances, garlic and olive oil wafted through in the air and we were getting hungrier by the minute. The best way to find the “right” place to eat is by following your nose…..check their menu which is usually posted outside the restaurant….check if the place full of tourists or locals (locals know the best spots)…..then go for it. Order the house wine in a carafe, an appetizer or two, a salad and sharing a main dish is OK and quite a common practice since the portions are usually large enough. After dinner you can stroll around the city and keep in mind that it is perfectly safe since most everyone is from the area and “bad guys” are not welcome……the locals look out for each other. Keep in mind that you are actually in a place where people have lived for generations and you are in their community….not a hotel or cruise ship or guided tour full of strangers and being controlled by someone else’s schedule…..you are a slow traveler and independent. As you stroll you most likely will hear music…….a violin musician practicing…..accordian musician practicing……a flutist playing a haunting piece under the ancient arches for the acoustics and if you are really lucky you will come across an orchestra rehearsal. Picture this….warm September moonlit evening, walking off dinner, wandering through the town and we stumble upon an orchestra rehearsing classical Italian music in a school auditorium…..a free open air concert. So we had to take advantage of it as we danced in the courtyard to a spontaneous musical experience. This entry was posted in Uncategorized on May 2, 2015 by Bob and Janice Kollar.